BP will pay a record $4.5 billion in fines and plead guilty to a dozen felony counts under a deal with the U.S. government to settle criminal charges stemming from the 2010 Deepwater Horizon accident that killed 11 workers and spilled nearly 5 million barrels of oil into the Gulf of Mexico. Federal prosecutors also announced new indictments against two BP supervisors for manslaughter and a former BP executive for hiding information from Congress and lying to law-enforcement officials. 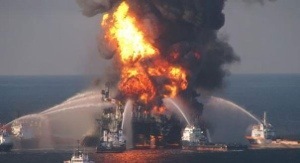 The settlement would resolve the British oil company’s criminal liability over the disaster — the worst oil spill in U.S. waters — but still leaves it to face civil charges in a trial that is set to begin early next year.